Attention Horse Lovers! 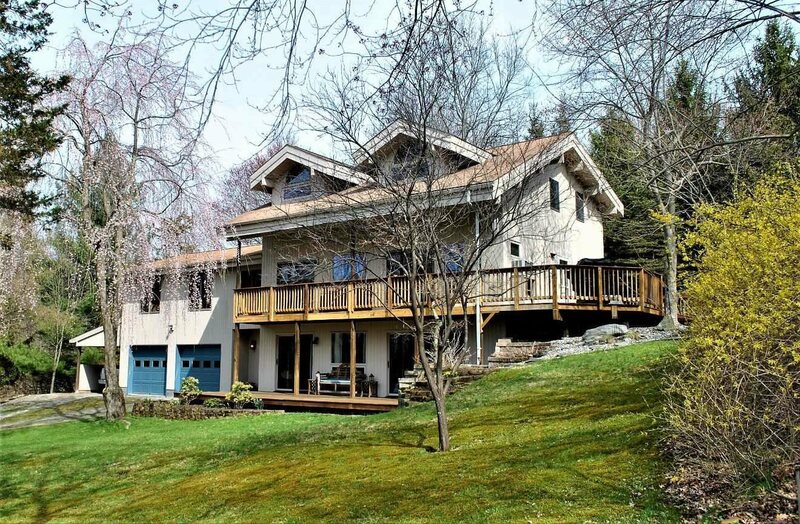 Meticulously Maintained Custom Built Lindal Cedar Contemporary. Located on over 6 sprawling acres of horse property with 2 ponds, This tastefully decorated 3 bedroom 4 full bath home is in move in condition. Natural light illuminates the open floor plan. 1st floor living area boasts gleaming hardwood floors & cathedral ceilings. Updated kitchen with granite counter tops & stainless appliances. Master Bedroom with master bath & wet bar area. This passive solar energy efficient home also offers a Daylight basement with wood stove, full bath & laundry area. If you are looking for horse property you found it! 3 stall barn with hayloft, tack room, electric, water & equipment shed. Fenced in paddocks & sand riding arena. After a day of riding kick back & relax on your private rear deck or patio with fire ring. Enjoy your seasonal rock garden Plenty of parking in your 2 car garage & carport.Short walk to the rail trail!